Reading and share top 1622 famous quotes and sayings about No Matter What by famous authors and people. Browse top 1622 famous quotes and sayings about No Matter What by most favorite authors. 1. "Animals keep you company when you're really lonely. It helps because when you have a friend around who always likes you no matter what - it's harder to feel bad or down." 2. "Takashi had no choice, and he'd always known it. This was one reason he'd triedso hard not to care about anyone, one reason why he'd known immediately just how dangerous Summer Hawthorne could be. Because now she was the one he couldn't sacrifice, couldn't walk away from, no matter how high the stakes. He could die for what he believed in. He just couldn't let her die as well." 3. "No matter what measures are taken, doctors will sometimes falter, and it isn't reasonable to ask that we achieve perfection. What is reasonable is to ask that we never cease to aim for it." 4. "Letting go maybe hard, but it's the best thing possible for you to do when you can't take anymore pain! Whether you're letting go of a person, a pet, or the past. No matter how hard it is to forget, to let go, you have to do it! Take that weight of your shoulders, kill that selected memory that hurts you and move on. No matter how hard it is to forget about that person, that pet, or that memory, in the long run it will be for the best! Why should you let go? You should let go because, you will be free from that pain it brings you, you will be free to move on from the past, you will be free from it all and not have to worry about the troubles it may have brought. It all starts with you! Make that change in your life that need to be done, because if you don't it will just be an anchor dragging you down, pulling you farther away from the shore in which your dreams, and your goals lie. Just let go of what you want to forget, let go of that you need to forget. It all starts with you!" 5. "All men are a disappointment. No matter what anyone says." 6. "Know that I love you, that I always will love you no matter what choices you make, what paths you have chosen, and what paths you choose in the future." 7. "Finding someone you love and who loves you back is a wonderful, wonderful feeling. But finding a true soul mate is an even better feeling. A soul mate is someone who understands you like no other, loves you like no other, will be there for you forever, no matter what. They say that nothing lasts forever, but I am a firm believer in the fact that for some, love lives on even after we're gone." 8. "When someone cries so hard that it hurts their throat, it is out of frustration or knowing that no matter what you can do or attempt to do can change the situation. When you feel like you need to cry, when you want to just get it out, relieve some of the pressure from the inside - that is true pain. Because no matter how hard you try or how bad you want to, you can't. That pain just stays in place. Then, if you are lucky, one small tear may escape from those eyes that water constantly. That one tear, that tiny, salty, droplet of moisture is a means of escape. Although it's just a small tear, it is the heaviest thing in the world. And it doesn't do a damn thing to fix anything." 9. "Cool hands grasped my shoulders and tried to pull me away from Camdus, but I wouldn't have it. I was going nowhere. I clutched his shoulders, breathing him in. I was determined to stay with my husband no matter what. They would have to pry me away. And then someone did." 10. "Aim for a million bucks, you suddenly need a billion. I upgraded my computer, but it wasn't enough. No matter what, it ain't fucken enough in life, that's what I learned"
11. "…It's as if they actually think that what other people think of them somehow doesn't matter. I mean, I know we're all supposed to believe that, but obviously, none of us actually do. And nor should we, because it does! It does matter! And the people who genuinely believe it doesn't tend to be the very people who ought to care most what other people think of them, because what the other people are thinking is, 'No, actually, I don't think the Chinese are "up to something,"' or, 'You should use mouthwash,' or, 'Your mania for the collective socialization of agriculture will surely cause the deaths of millions,' or, 'Forty cats is too many cats." 12. "I'm grateful for always this moment, the now, no matter what form it takes." 13. "Mrs. Heath wanted to sprinkle their minds with grass seed and watch the blades spike up through the earth, flat and predictable as a golf course. She wanted dependable students, well fed but not necessarily nourished. But he was not in that category. Admittedly, he could not count on his perceptions of letters and words, and he was not always accurate. He misused words most when he liked their sound. A sentence had a kind of music, and the word sounded right. The definitions were never as interesting as the sound they made coming out of your mouth. He rolled their flavors around on his tongue, tasting every nook and cranny, but he could not be trusted to deliver the right answer and she would never give him better than a C, no matter what genius work he produced. The way he saw it, his mind was a big unruly field of wildflowers. One day he would shower the world with blossoms." 14. "The stove, she knew, wished it were a volcano, the humble teaspoons wished they were steamshovels, and the sink wished it were a well so all the others could have their wishes. Yet they all stayed exactly the same no matter what they wished, no matter what they saw and heard." 15. "So I didn't adopt Homer because he was cute and little and sweet, or because he was helpless and needed me. I adopted him because when you think you see something so fundamentally worthwhile in someone else, you don't look for the reasons - like bad timing or a negative bank balance - that might keep it out of your life. You commit to being strong enough to build your life around it, no matter what. In doing so, you begin to become the thing you admire." 16. "As I run I tell myself to think of a river. And clouds. But essentially I'm thinking of not a thing. All I do is keep on running in my own cozy, homemade void, my own nostalgic silence. And this is a pretty wonderful thing. No matter what anybody else says." 17. "I work with Garry no matter what. What I wanted to keep going was the streak." 18. "Once you develop your own style, you know when you're able to give your best. Feeling at home is part of it, and I don't think that's an L.A. thing. It's a matter of the environment and of what affects you." 19. "And then there's that person that no matter what, they'll answer your call at 4 am. Your 4am-er. They'll say exactly what you need to hear to bring you back to earth. Your comfort, your voice of reason, your hit upside the head. And he'll always be my 4 am-er." 20. 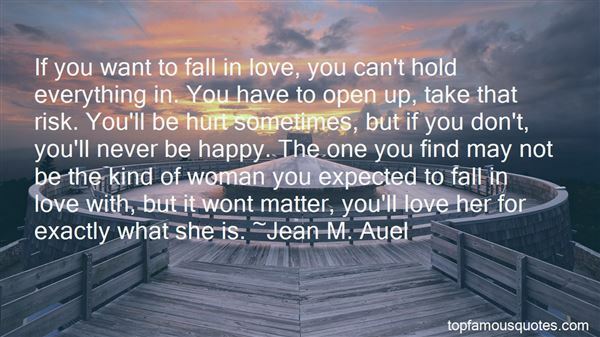 "If you want to fall in love, you can't hold everything in. You have to open up, take that risk. You'll be hurt sometimes, but if you don't, you'll never be happy. The one you find may not be the kind of woman you expected to fall in love with, but it wont matter, you'll love her for exactly what she is." 21. "I wouldn't want to see any animal in pain, no matter what." 22. "When you reach my age, you understand that you are a player with skin in the game, no matter what game it is." 23. "Wisdom is not having God's perspective of the whole matter before us, but having God's perspective about what next response will honor Him while keeping us still usable to Him." 24. "Sometimes Edith came into the room and sat on the bed beside him and they talked. They talked of trivial things – of people they knew casually, of a new building going up on the campus, of an old one torn down; but what they said did not seem to matter. A new tranquility had come between them. It was a quietness that was like the beginning of love; and almost without thinking, Stoner knew why it had come. They had forgiven themselves for the harm they had done each other, and they were rapt in a regard of what their life together might have been.Almost without regret he looked at her now; in the soft light of late afternoon her face seemed young and unlined. If I had been stronger, he thought; if I had known more; if I could have understood. And finally, mercilessly, he thought: if I had loved her more. As if it were a long distance it had to go, his hand moved across the sheet that covered him and touched her hand. She did not move; and after a while he drifted into a kind of sleep." 25. "Here is the trap you are in.... And it's not my trap—I haven't trapped you. Because abortions are illegal, women who need and want them have no choice in the matter, and you—because you know how to perform them—have no choice, either. What has been violated here is your freedom of choice, and every woman's freedom of choice, too. If abortion was legal, a woman would have a choice—and so would you. You could feel free not to do it because someone else would. But the way it is, you're trapped. Women are trapped. Women are victims, and so are you." 26. "But it would be a great mistake to think that the awakening of desire for the Bridegroom would produce a wave of monastic withdrawal into the fasting and prayer of passive waiting. That is not what the awakening of desire for Christ would produce. It would produce a radical, new commitment to complete the task of world evangelization, no matter what the cost. And fasting would not become a pacifistic discipline for private hopes, but a fearsome missionary weapon in the fight of faith." 27. "I sounded like Horton the Elephant. "A person is a person no matter how small." What the hell was I doing standing in the middle of a cave, in the dark, surrounded by wererats, quoting Dr. Seuss, and trying to kill a one-thousand-year-old vampire?" 28. "Things change after people are married," she finally said, talking more to herself than to him. "People change. ""Not usually for the better. ""How would you know? Are you an authority on marriage...or on me, for that matter? You act just like Daniel, as if you know what's best for me. Well, maybe I should start deciding what I want! "His eyes gleamed like a cat's. "Maybe you should. What do you want? 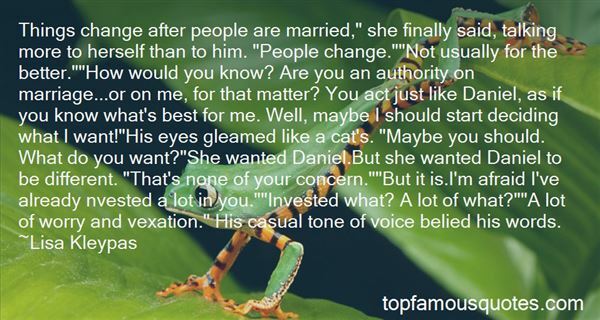 "She wanted Daniel.But she wanted Daniel to be different. "That's none of your concern. ""But it is.I'm afraid I've already nvested a lot in you. ""Invested what? A lot of what? ""A lot of worry and vexation." His casual tone of voice belied his words." 29. "You might argue that I make the rounds no matter what year it is, but sometimes the human race likes to crank things up a little. They increase the production of bodies and their escaping souls." 30. "They say love is blind...but it isn't. Love is perfect sight. Love is the ability to see a person, I mean really see him-his strengths, his weaknesses, his flaws, all his past triumphs and mistakes-and view that person not as the world says you're supposed to see him, but as you see him-as that special someone you know you will always embrace, body and soul, no matter what anyone else says or thinks I know I can't tell anyone what I've been through. I know they wouldn't understand. They don't see him the way that I see him. All they know is the legend, the darkness. They don't know the inner beauty, the warmth and the joy more intense than anything I ever thought was possible to experience. They don't know the truth behind the name. My angel. My only. Lucifer." 31. "Faith that it's not always in your hands or things don't always go the way you planned, but you have to have faith that there is a plan for you, and you must follow your heart and believe in yourself no matter what." 32. "Dignity is not a symbol bestowed on man, nor does the word itself possess force. Man's dignity is a force and the only modus vivendi by which man and his history survive. When mid-twentieth century Germany did not let man live and die with this right, man became an animal. No matter how technologically advanced or sophisticated, when man negates this divine right, he not only becomes self-destructive, but castrates his history and poisons our future. This is what 'The Nazi Drawings' are about." 33. "So the gods must mean something else," said Jix. "God, not gods!" insisted Johnnie.Nick threw up his hands. "God, gods, or whatever," said Nick. "Right now, it doesn't matter whether it's Jesus, or Kukulcan, or a dancing bear at the end of the tunnel. What matters is that we have a clue, and we have to figure it out.""Why?" Johnnie asked again. "Why does God – excuse me, I mean ‘the Light of Universal Whatever'- why does it just give us a freakin' impossible clue? Why can't it just tell us what we're supposed to do? ""Because," said Mikey. "the Dancing Bear wants us to suffer." 34. "Achilles might be a good papa to the family, but he was also a killer, and he never forgives.Poke knew that, though. Bean warned her, and she knew it, but she chose Achilles for their papa anyway. Chose him and then died for it. She was like that Jesus that Helga preached about in her kitchen while they ate. She died for her people. And Achilles, he was like God. He made people pay for their sins no matter what they did.The important thing is, stay on the good side of God. That's what Helga teaches, isn't it? Stay right with God.I'll stay right with Achilles. I'll honor my papa, that's for sure, so I can stay alive until I'm old enough to go out on my own." 35. "And finally, I know that you know you're no conquest, so don't act like you seriously think that. You and I have been through too much together. We're too close, too connected. I wasn't that crazy on spirit when I said you're my flame in the dark. We chase away the shadows around each other. Our backgrounds don't matter. What we have is bigger than that. love you, and beneath all that logic, calculation, and superstition, I know you love me too. Running away to Mexico and fleeing all your problems isn't going to change that. You're just going to end up scared and confused." 36. "As an opener, I'd like to state that elves are certainly NOT cliché. It doesn't matter if they all have pointy ears, or they all live a long time, or even if they all like forests. It doesn't matter if they're short or tall or both. It doesn't matter if they're related to forest spirits or even angels. Regardless of how many elves are like one another or how many elves appear in how many books, elves are NOT cliché.Why?Well, for one, an elf is a creature. How can a creature be a cliché? Is a human cliché? They certainly do appear in a lot of books! How about dragons? Now there's a popular subject! Are dragons cliché as well? Well what about vampires too? Or werewolves? Or bats? Or rabbits? Or mice? Or owls? Or crows? Cats??" 37. "How satisfying will it be to know that no matter what happens to your relationship and no matter where or with whom he ends up in his life that you taught him everything he knows...? Catty? Maybe, but that's a fun thought." 38. "No matter what deal-breakers are negotiated upfront in a ménage, someone always ends up freaked out in a wicker chair across the room." 39. "Ponyboy, listen, don't get tough. You're not like the rest of us and don't try to be..."What was the matter with Two-Bit? I knew as well as he did that if you got tough you didn't get hurt. Get smart and nothing can touch you..."What in the world are you doing?" Two-Bit's voice broke into my thoughts.I looked up at him. "Picking up the glass. "He stared at me for a second, then grinned. "You little sonofagun," he said in a relieved voice. I didn't know what he was talking about, so I just went on picking up the glass from the bottle end and put it in a trash can. I didn't want anyone to get a flat tire." 40. "Music is a total constant. That's why we have such a strong visceral connection to it, you know? Because a song can take you back instantly to a moment, or a place, or even a person. No matter what else has changed in you or the world, that one song stays the same, just like that moment." 41. "Even when we're right, we may be wrong. If--in the process of debate--we've hurt the heart of another being, it matters not whether we issued a perfectly executed unbroken chain of logic. In the end, that's an argument we've lost, because whatever we might have gained in intellectual pride, we surely lost in character." 42. "Everybody has a home team: It's the people you call when you get a flat tire or when something terrible happens. It's the people who, near or far, know everything that's wrong with you and love you anyways. These are the ones who tell you their secrets, who get themselves a glass of water without asking when they're at your house. These are the people who cry when you cry. These are your people, your middle-of-the-night, no-matter-what people." 43. "Option three: Edward loved me. The bond forged between us was not one that could be broken by absence, distance, or time. And no matter how much more special or beautiful or brillant or perfect than me he might me, he was as irreversibly altered as I was. As I would always belong to him, so would he always be mine.Was that what I'd been trying to tell myself?"Oh!""Bella?""Oh. Okay. I see. ""Your epithany?" he asked, his voice uneven and strained. "You love me," I marveled. The sense of conviction and rightness washed through me again.Though his eyes were still anxious, the crooked smile I loved best flashed across his face. "Truly, I do." 44. "I am... me. No matter what I say or do, I'm still me. That 's what Satozuki told me once. The things I feel, the things I do... Being a vampire, Being a man, being betrayed by my mother... when all those things come together, they make up "me." But none of these things taken separately. I'm just me." 45. "That's how fossil hunting is: It takes over, like a hunger, and nothing else matters but what you find. And even when you find it, you still start looking again the next minute, because there might be something even better waiting." 46. "But no life was without it's strain & strife, not if it was fully lived. Opening up to experience, even the good ones like trust & love, was to open yourself up to the pain. I suppose the key was to not compound matters by making the rest of it unnecessarily hard. My need for control had certainly done that in the past. So I made a promise to myself in that moment. I would make a concerted effort to reach for what was soft & good in this world. I'd find a place to settle into, and hold still so that this world's good and soft could reach back & touch me as well." 47. "She loves you," the Prince cried. "She loves you still and you love her, so think of that--think of this too: in all this world, you might have been happy, genuinely happy. Not one couple in a century has that chance, not really, no matter what the storybooks say, but you could have had it, and so, I would think, no one will ever suffer a loss as great as you." 48. "I understand everything," he said. "You understand nothing, but it really doesn't matter, since what you mean is, you're glad to see me, just as I'm glad to see you because no more loneliness. ""That's what I mean," said Fezzik." 49. "We feel much happier and more secure when we think we know precisely what to do, no matter what happens, then when we have lost our way and do not know where to turn." 50. "No matter what accomplishments you make, somebody helps you." Hypocrite reader -- my fellow -- my brother!"